Welcome to one of Chesterfield’s best kept secrets! 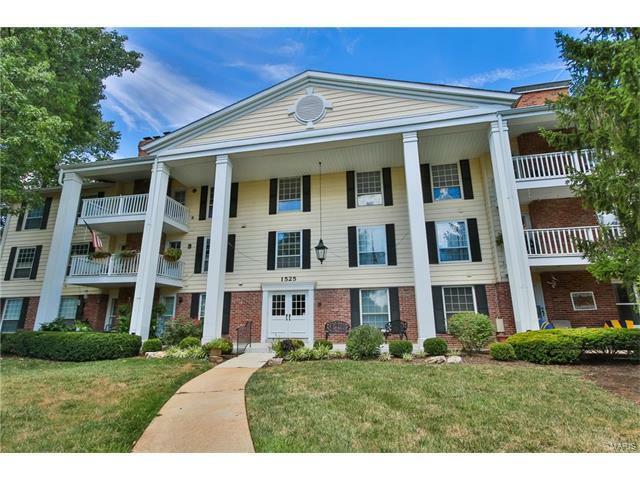 Nestled in the back of beautiful Brandywine Condo complex, this spacious, well-kept home has so much to offer. Smart layout, w/open dining/living room arrangement, & tasteful fireplace as focal point, flanked by atrium doors to the balcony, where you’ll find the view of the park-like setting tranquil and lovely. Extra den/office has unlimited possibilities! 2 large bedrooms are on opposite ends of condo, each w/ a generous walk-in closet. Eat-in kitchen is drenched in afternoon sun, making it cheery and bright. Condo has in unit laundry, fitting full-size washer & dryer. Extra 6x6 assigned storage unit is on same floor. 2 assigned parking places deeded to this unit in underground, secured garage, and secured building is fully serviced by an elevator. That’s not all! Pool/clubhouse included in HOA fees. Eberwein Park, groceries, restaurants, and shopping w/in walking distance, + Parkway schools! Great highway access! Clarkson to Left on Baxter to Left on Old Baxter Road, to end of road and Brandywine Condo Community. Building is near the back of the community.